Deep, calming tones are combined to produce soothing wind songs with our Amish made Big Ben 82" Wind Chime. 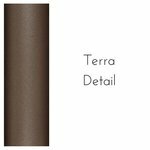 Big Ben is a grand set of chimes, with 82" long chime tubes that are a lovely terra brown shade that blends beautifully with your outdoor scenes. We offer personal engraving options on all of our chimes. Engrave names, dates, clip art and more. Wind chime tops and strikers are made of poly lumber. Poly lumber is environmentally friendly as it consists of recycled milk jugs. Poly lumber is unbreakable and will not crack or chip. Aluminum tubes are powder coated which bakes the color onto the aluminum, making it durable and more resistant to weather. O-rings are provided for chimes with round tubes. If placed at the bottom of each tube, they act as bumpers and reduce clanging.